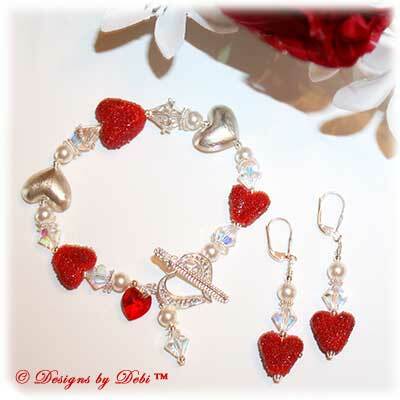 It's American Heart Month and Valentine's Day is coming so I decided to make a set of jewelry with a heart theme. I began with some artisan lampwork beads handmade by Joyce O'Shea of Lampwork by Joyce. 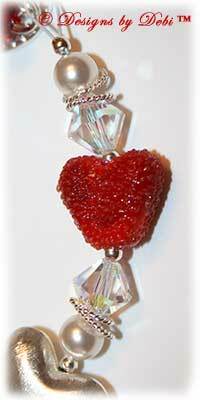 They're heart-shaped red beads with a sugar-like texture. 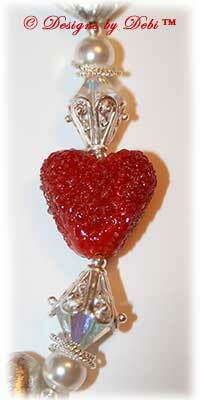 The center heart bead is capped with elegant sterling silver cone caps. 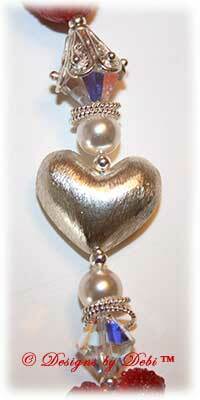 I also used brushed sterling silver heart beads handmade by silversmiths in Bali, Indonesia. In between the heart beads you'll find beautiful Swarovski® Crystal AB (aurora borealis) bicone beads, white Swarovski® pearls and some floating sterling silver twisted rings. 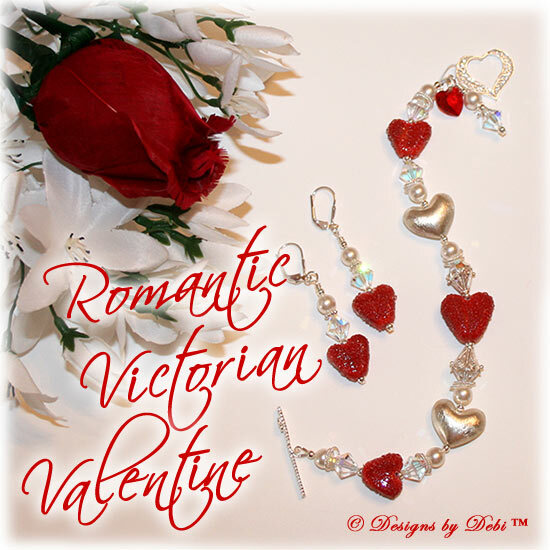 The bracelet closes with a delicate filigree heart toggle clasp. 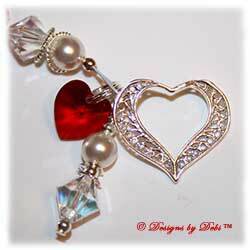 And hanging near the clasp are a red Swarovski® crystal heart and a coordinating dangle charm that has 2 sterling silver hearts hiding sweetly in between the pearl and crystal. 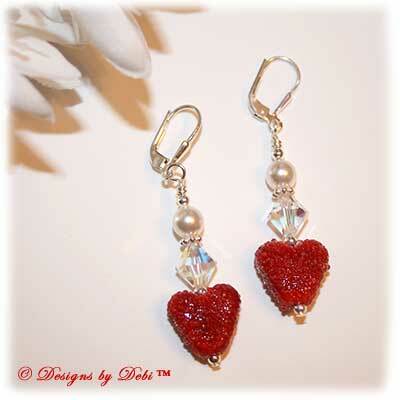 The earrings are leverback style and were made with the same glass beads, Swarovski® crystals and pearls. 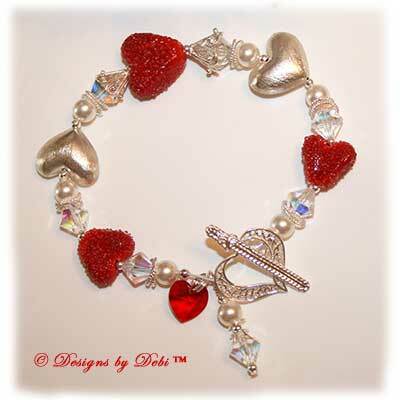 The charity I've chosen to receive the donation from this month's jewelry set is the American Heart Association. Heart disease is the number 1 cause of death for both men and women. In America, there's a heart-disease related death approximately every 39 seconds. The good news is that by making healthy lifestyle changes you can significantly lower your risk. The American Heart Association and its family of websites offer a wealth of information on changes you can make to decrease your risk of heart disease. They also offer various tools to assess your risk and help you lower it. You can find tons of educational materials, articles, tips, heart-healthy recipes and so much more to help you on your journey to a healthier lifestyle. The American Heart Association provides funding for research into the causes, diagnosis and treatment of heart disease and stroke. To find out more about the American Heart Association or to make a donation on your own, go to www.AmericanHeart.org. The earrings are 2 1/8 inches long. 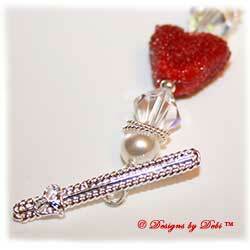 The bracelet measures 8 inches long and will fit a 6 inch (loosely) to 6 3/4 inch wrist. If you need the bracelet re-sized, please let me know at time of purchase and this can be done prior to shipment at no additional charge.